The Artful Maven: CHA - It's Also About The Goods! Oh my creative word! I am still overwhelmed at the mahoosiveness of the CHA show everyone! It was every crafter's dream! I cannot even imagine this, but everyone who has attended in past years said it used to be twice as big. WOW! 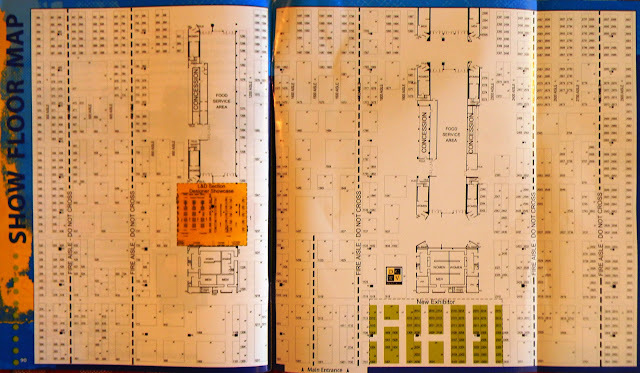 For you numbers people, I counted 26 aisles, with booths on each side. The booths ranged from #300 to #2997. 394 exhibitors occupied the booths. Map of the show room floor. Some were tiny and some were massive...some were blah and some were ornate. My favorite decorated booth was Idea-ology. All it needed was a bed, and I could have lived in it! It was an antique haven! I spent lots of time there, as well as the Ranger, Stamper's Anonymous, and Sizzix (Where the best Magician ever could be found...WOW!) booths. The samples at these four places were to say the least - dreamy...a feast for creative eyes and impressive beyond words! Those designers left me nothing to imagine with...they took all the mojo and made the best pieces of Art! Most I/we already know...Jim, Shelly, Candy, Kaz, Joy, Chelle, Richele, Tammy, Wendy, Tim, Dyan, Claudine, and Paula and Deb (Hope I didn't miss anyone I know...sorry if I did. Drop me a note.). Please check their blogs for sample pieces now through the next week or so, as I didn't want to step on their creative toes and post their projects on my blog. AMAZING people, really AMAZING! Before I start rolling, I'm having a GIVEAWAY!!!! On Wedneday, I'll have the number generator choose 3 crafty peeps (Hopefully followers.) who comment on this post, and tell me what products you saw or heard about (Here or else where.) at CHA that you want to have. 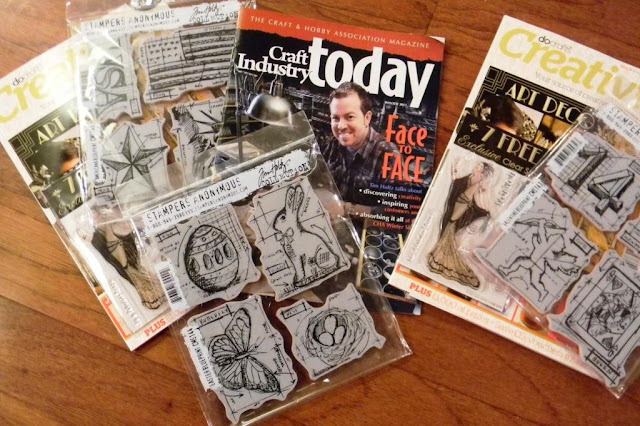 I have up for grabs, 3 new Tim/Mario III Blue Print Stamp Sets from Stamper's Anonymous, along with a magazine...2 from DoCrafts and one from CHA with an autographed article from Tim himself. Each winner will get a magazine and a stamp set. Good luck! 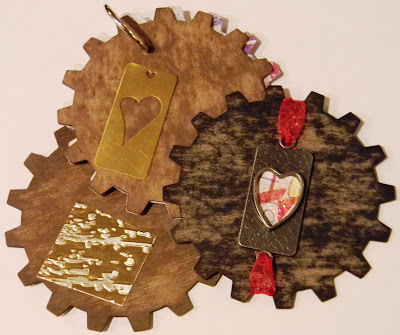 From Ranger: Tim Holtz Distress Paints- These are amazing! They are very thinned out, and while painted with them (Fingers or paint brush is best in my opinion.) you can alter them while wet with water or another color of paint, but when dry they are permanent...genius! Dylusions Ink Sprays- Six New colors...woohoo...The White Linen is a must! AND, she has several new stamps sets...wonderful Sea Creatures and Monsters and large silhouettes of retro people with stencils for them...LOVE them! Vintaj Patinas- New Colors...more woohoo. AND, they brought out a line of new tools that are fabulous...the metal loop maker is a must have! Claudine Hellmuth Stencils- She has six to choose from...all wonderful! There are many videos out on these products already. 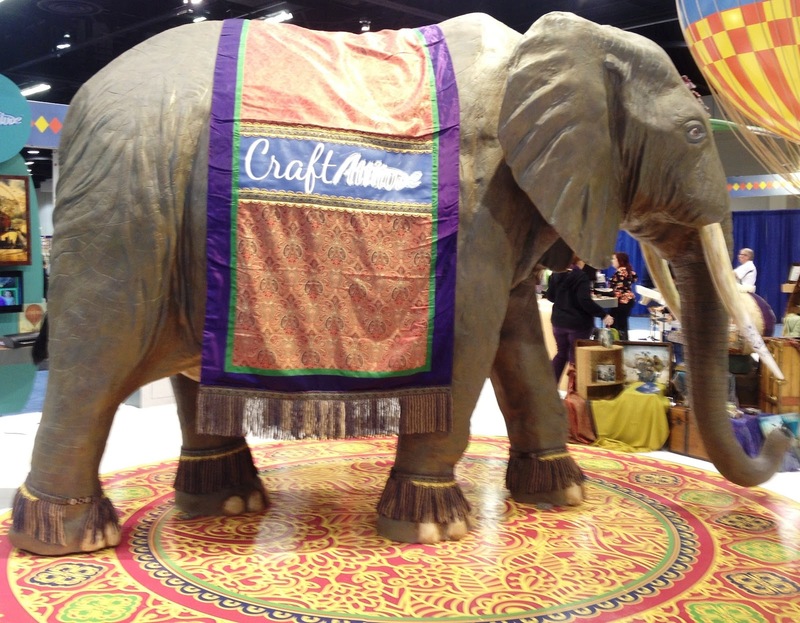 From Craft Attitude: They had a grand elephant to help showcase theirs design. There are Eight Lines of this amazing Printing Film. It's all the same stuff, but you use it in different ways for Wood, Flowers, Jewelry, Shoes, Quilts, Decor, Magnets, and Scrapbooking. You scan a picture in or find one on the internet, print it off on an "Ink Jet Printer" and use adhesive to apply it to one of the above mentioned bases. It is clear and takes the shape and background of the object....AMAZING! From Eclectic Products: E6000 Spray- Now one of the strongest glues comes in a spray! It's amazing! I can't wait to get my hands on some. Clean up is a breeze on a craft sheet. From Spellbinders and Susan Lenart Kazmer: Dubbed Media Mixage, they've teamed up and now have metal dies and embossing plates that match her bezels and flat metal pieces. You can cut the metal, emboss it, and cut paper to fit into it. All that's left is to fill with her Ice Resin if you want. There is even a paper line and colored metal foil. It's all cool stuff! From Faber Castell: The New Mixed Media Sets come Gelatos, Watercolor Pencils, Markers, Pens, and Pastels. I used them all on this Make N Take piece, especially the bird (Made by Maya Road.) They all work to blend together with some sort of wet material, like water or a baby wipe. Some sets come with stamps. From Maya Road: This was from a Make N Take. 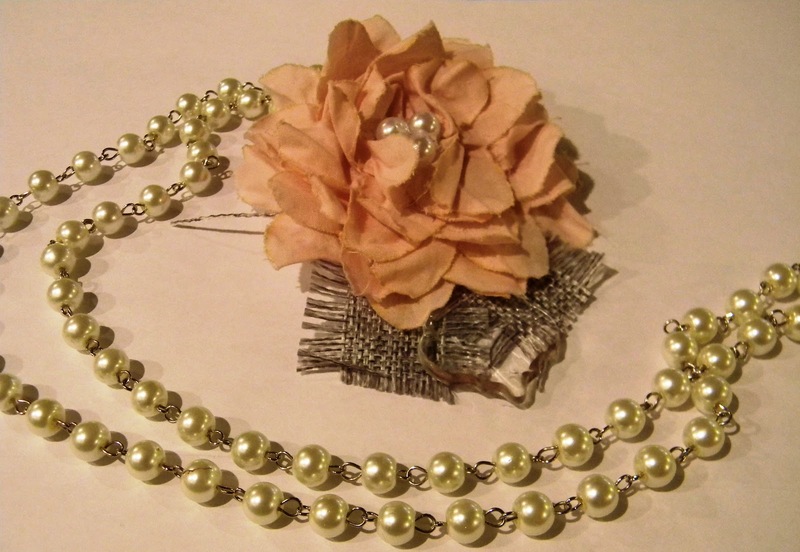 The String of Pearl Bead Chain was wonderful with the Scallop Trim Ribbon made into a flower. You can't see it well, but there is a Crystal Bead Trinket on top of the Burlap Trim. 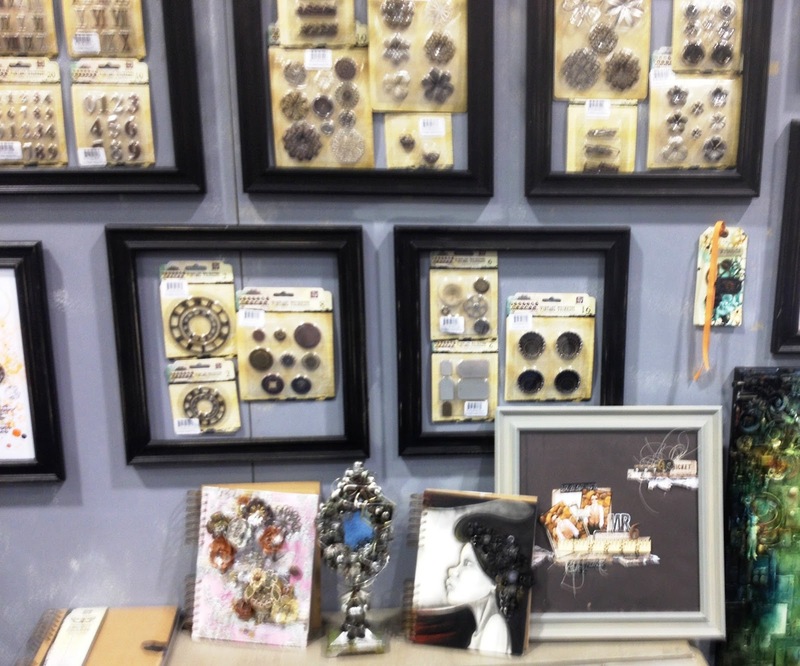 They carry a plethora of gorgeous alterable items...from Chipboard to Kraft to Beads and Pins. From Prima: Definitely one of the stars of the show for me, was this new line by Anna Dabrowska called Mechanicals. They are great little embellishments and very alterable to be vintage pieces. Her sample pieces were amazing! From The Crafter's Workshop: Stencils were everywhere, but the new ones from Julie Fei-Fan Balzer, Dina Wakley, and Rhonda Palazzari (My Ranger U friend.) made by The Crafter's Workshop were fabulous!!! So many UBER COOL DESIGNS! So many people! There is a stencil for everything! From Die Cuts With A View. 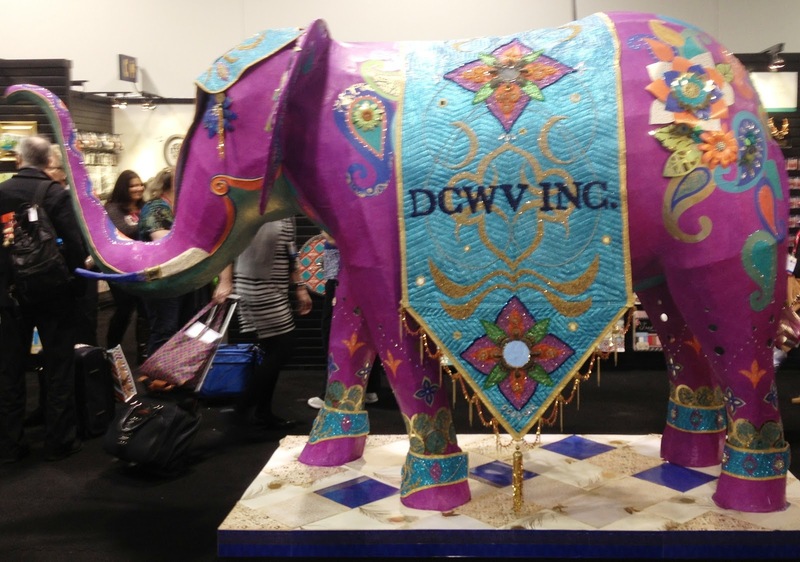 : Another elephant, but beaded to the max...WOW! The folks from DCWV Inc.they don't just make die cuts anymore. There was a mecca of papers and stash to match, everywhere in this large booth. Gorgeous designs from vintage and nouveau to old world and retro. From DoCrafts: This United Kingdom based company had one of the best freebie items of the show...a tote bag with the Union Jack on it...I scored one, as well as a couple of last months magazines (One of which I had courtesy of my English friend Anna Christensen, along with a few stamps and dies...thanks girl!). They had amazing lines of stamps, papers, stickers, and embellies. I especially loved the line from Papermania called Urban Stamps, and can't wait to get them. I could have sat in the booth for hours talking to the reps...oh the accents! From We R Memories Keepers: Another amazing invention (Remember the Crop o Dile?) ...an Envelope Punch Board. In about 4 steps you can have any sized envelope...well within reason people! This tool scores the paper, punches the corners, measures it out, and even has a bone folder. This one is selling fast, so if you find one, snag it. From Purple Cows: I so wanted to try this myself, but had no time. What is it? It's painting with Encaustic Wax! Gorgeous colors of wax are used with a Melt Craft Iron Tool, along with different tips, and gorgeous and vibrant Encaustic Wax Paints to create pictures or writing. You can even stamp with it! The possibilities are endless! I will definitely be looking for a class on this, or teach myself, and then others! From Clear Stamp by Craffiti: Okay, this was the most fun booth for me, and oh so personal! You stand in front of Mr. Craffiti (Forgot his name.). He stares at you and starts drawing. You are able to see what he draws as he goes, and in about 3 minutes you get a print out to hang from a lanyard. 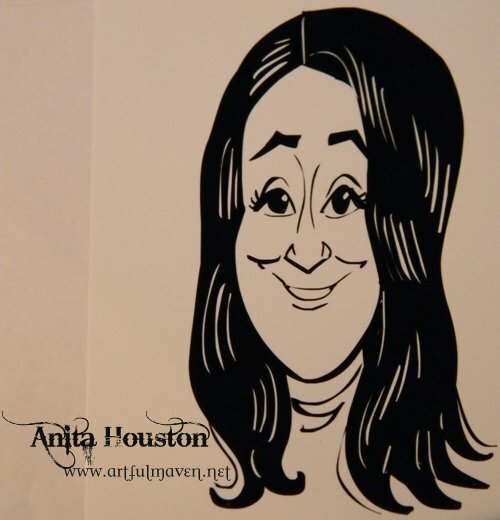 That print, now your caricature, is turned into a stamp just for you. It takes a few weeks to get it. As you can see above, I am turning mine into my new watermark, so you will probably get tired of seeing it! I look a little like Jay Leno (Cash, cars, and stars...oh yeah! ), but a lot like my brother...just want to smack it...but it was oh so fun! My hair was straight that day, and I was tempted to go back and have a curly hair day one made, but the line was out the door. Everyone's was fabulous and unique! Also, the CHA people picked the HOT TOP 20 OF THE SHOW from dozens of NEW craft products entered in the Innovations New Product Showcase. Here they are, and you will see some I listed too as indicated by the ***. ***Faber-Castell – Mix & Match Gelatos Misting Kit enables the creation of colorful mists using a simple process and the tools using the 8 NEW Gelatos colors. Sticky Sticks LLC – Sticky Sticks are tongue depressor-sized craft sticks with the most amazing adhesive on one side of one end. They stick permanently to paper, ribbon, felt, foam, and wood. CTF Enterprises, Inc. – FixNZip is a patented, zipper slider replacement that repairs zippers without tools or sewing. 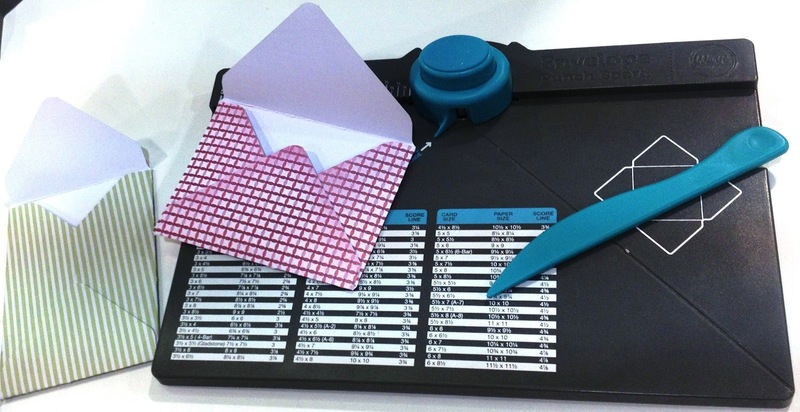 ***We R Memory Keepers – Envelope Punch Board is the first and only Envelope Punch Board on the market! Just punch and score for perfect envelopes. No scissors necessary. ***Ranger Industries – Tim Holtz Distress Paints are fluid water-based acrylic paints for multiple surfaces and are reactive with water just like Distress Inks and Distress Stains--perfect to accomplish a wide variety of artistic techniques. Environmental Technology Inc. – EnviroTex Jewelry Clay® is a new professional grade Jewelry Clay® that will not shrink when cured. EnviroTex Jewelry Clay® will adhere to glass, metal and wood. Fiskars Brands Inc. – The AdvantEdge™ Punch System adds decorative borders to craft projects while the slide-and-lock technology keeps the paper in one place and slide the punch cartridge from one lock-in slot to the next, keeping every punch perfectly spaced. Fiskars Brands Inc. – Fuse Creativity System® is the only 12” system on the market that can die cut and letterpress in one easy pass through the machine. Beadalon – The Jewel Loom™ designed by International Jewelry Artist Julianna C Hudgins fits perfectly in the palm of your hand allowing for ease of use for a comfortable grip and ultimate control while bead weaving. Plaid Enterprises Inc. – Plaid FolkArt Handmade Charlotte Stencils designed by Rachel Faucett, include functional, family-friendly designs that come to life with FolkArt paint. Plaid Enterprises Inc. – Martha Stewart Crafts™ Glass Paint is specially formulated, high performance premium paints that are permanent, dishwasher safe, and UV/weather resistant. ImpressArt® Metal Stamps – ImpressArt® Design Stamp Packs offer jewelry and mixed media artists collections of metal stamps in themes ranging from weddings and family to sports and shabby chic. Spellbinders Paper Arts – Spellbinders Imperial Gold is brings out the 4th dimension with die templates that cut, emboss, stencil and deboss. Never before have you had the ability to cut & create in multiple layers with a single die template. Katy Sue Designs – Silicone Molds for decorating cupcakes and candies are FDA compliant perfect for fondant, candy or chocolate top instantly. With developments in food safe colourings such as pens, crafters can now transfer colour techniques to their cakes. ***Purple Cows, Inc. – Encaustic Paint is handmade in the USA from the highest quality of naturally purified beeswax, damar resin with a 1:8 ratio and the finest dry pigments. Global Solutions, Inc.– Self Adhesive wax seals are an easy way to make your project special. Simply peel and stick the seals on to invitations, scrapbooks, cards, soap or wine bottles. The DMC Corporation – Emma Broidery: Memory Thread How To Guide features more than 60 pages of instructive photographs and projects that educate, encourage and inspire crafters and stitchers alike. The book includes step-by-step instructions for trendy jewelry making and paper crafts as well as needlework applications. ***Craft Attitude – JEWELRY ATTITUDE™ is a way for jewelry makers to personalize their metal, leather, beads, charms and accessory jewelry items with photos and names. By printing right on the inkjet compatible film, photos and words are crisp and clear. Krylon – Krylon® Glitter Blast™ Glitter Spray is a uniquely intense, sparkling glitter finish with exceptional depth that makes it easy to achieve an irresistible look on almost any surface. June Tailor, Inc. – T-Shirt Transformation Ruler Center, lets you mark and cut perfect T-Shirt blocks for quilts, tote bags, pillows and more. Printed grid lines and 45° markings to perfectly align and center t-shirt graphics. I couldn't believe how much awesome stuff was at this CHA show! 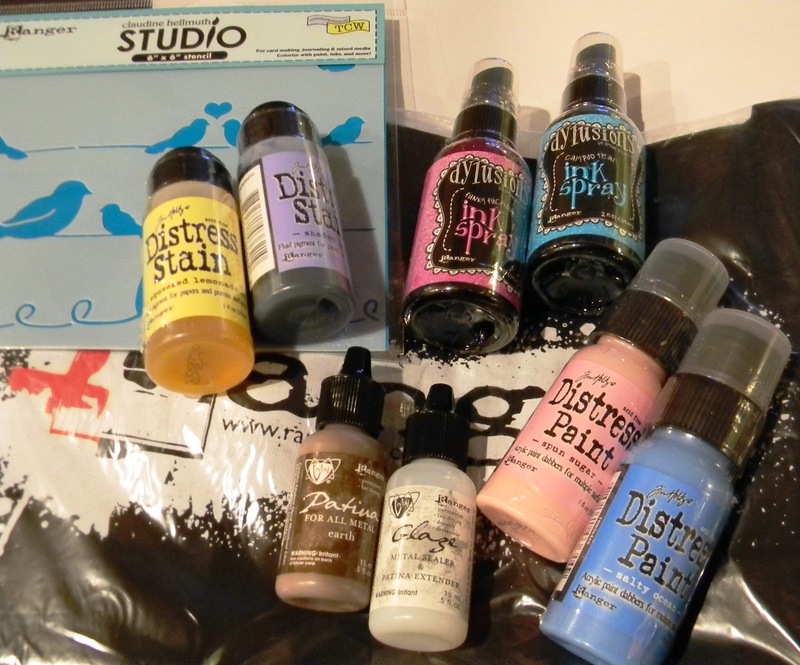 Im dying to get some Distress Paints, Ronda Palazzari stencils and Anna Dabrowska's Mechanicals. We can only pick three??? 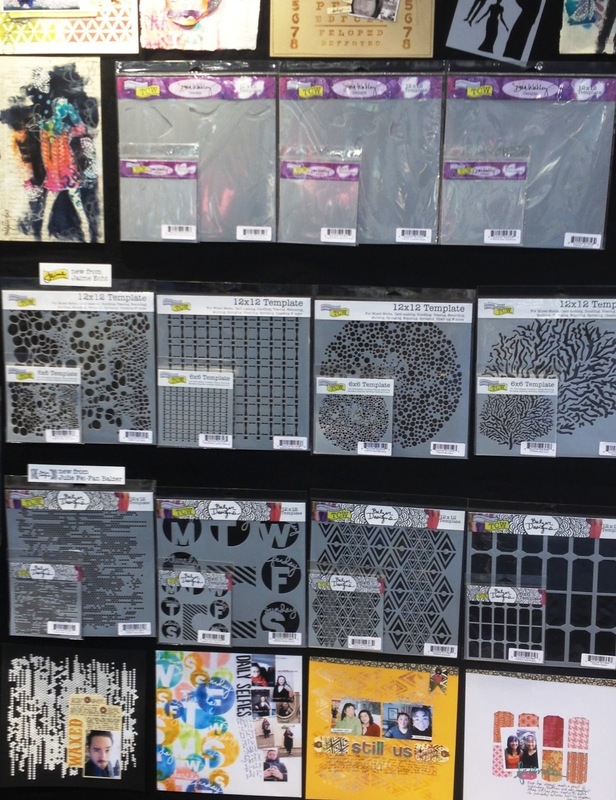 Actually, it's easy, at least for me; Tim's distress paints, Dyan's new Dylusions sprays & Julie Fei-Fan Balzer's new stencils for Crafters' Workshop are all at the top of my wish list. Thank you for offering such an awesome prize, it would be wonderful to win. Thank you also for sharing your CHA experience. The photos are terrific, it's thrilling to see so much new product & gorgeous samples. I love so much from the new goodies. Distress Paints are at the top of my list. Anita not here for the prize(I am lucky to have the stamps already :)),just wanted to say hi. Thanks for sharing CHA with those of us who couldn't go! It looks and sounds amazing. Loved your make and takes too. Thanks for the CHA rundown, It must have been amazing to see. 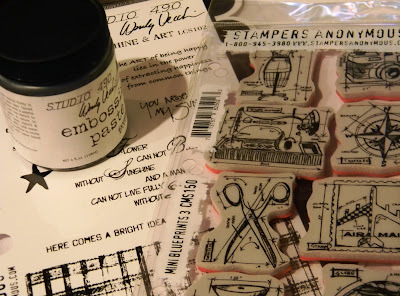 I think I my first must have are some distress paints, and like you I love the Time Traveler Stamp set from Ranger and Tim Holtz. I also saw a video of him demoing a Crease Cutting pad that looked like a lot of fun. 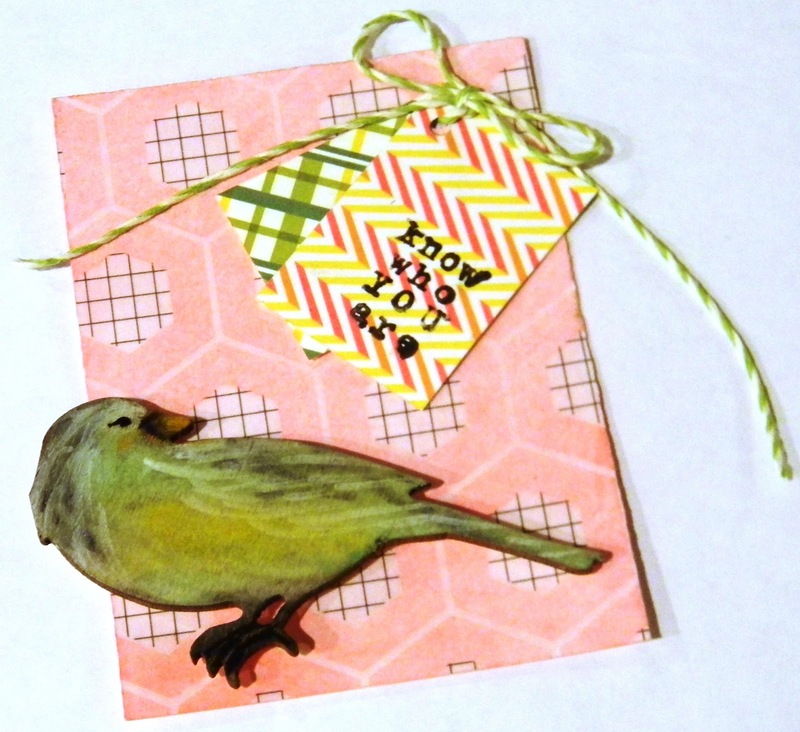 I also love all the new Dies from Tim and the stencils from Dyan, Claudine and Crafters warehouse.. I've probably forgotten some of the things I saw too, lots of new paper pads too. Gosh Anita...........this is so amazing........so much crafty bits......i would need a bank loan !! I so want to get my hands on the Distress Paints......also the stamps and of course dies..............everything Ranger/TH really !!!! Fab Giveaway...hope I am lucky. Thank you for the chance. My gotta haves? Distress Paints. New Dylusions Sprays. Dina Wakley stencils and her new book. Oh there are more. Yes there are! But you said it could only be three. Those are the top of my list! So glad you had a fabulous time and thank you for sharing the love! Wow! fantastic products bought. Fantastic photos thank you for sharing them with me. I can not wait to get these wonderful products will appear in stores in Poland. So many wonderful new product... the new Dylusion inks, the Distress Paints and the fantastic new stamps from Tim Holtz. I loved this post...you are just bubbling over with excitement and enthusiasm....and I can almost *feel* your fingers twitching in anticipation of using these new products. Thanks for sharing the show from your perspective! I am also very excited about the TH Distress Paints. They look like lots of fun to work with. I'm blown away by the new Spellbinder's products...the letterpress dies are gorgeous. And, because I'm a paper addict, I swoon over anything Graphic 45. I think their Secret Garden papers are gorgeous...and French Country makes me swoon. Welcome home, Anita! I have my eye on that envelope punch board, and also a lot of stencils and wood veneer shapes I see coming out of the show! Thank you for the little trip to CHA for those of us unable to attend! Top of my list Idealogy, TH picture window die and I think the Envelope Maker is a fabulous idea! Thank you for the chance to win some goodies! wow thats an amazing experience Anita, your brain must have been frazzled looking at all of these wonderful goodies on sale. Could not imagine how huge this event was so thank you for sharing. Lucky lucky you- getting to go to CHA. It must be cool to see everything that is coming out before the "rest" of us. 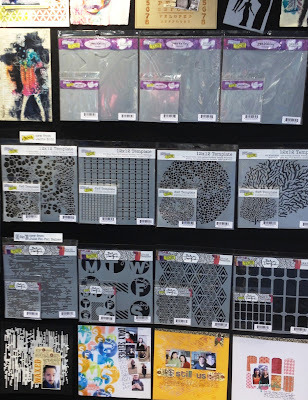 I've been looking on line and have seen some cool stencils, the new Dylusions sprays and stamps (her best so far I think) and those new Distress Paints are on my wish list. Have a great day and can't wait to see who wins. Yes, Wendy's pastes I NEED! and of course all the Crafter's workshop ones have me drooling on my keyboard also! Bo bunny had some cool looking stamps and their Prarie chic line is very cool! Anita, I do believe you had a great time at CHA! I sure hope to go next year! What a great post to share with us and look at all that wonderful must have stuff! Those stencils really are amazing and pulled me right in. Love that sketch of you, so adorable!!! Well have a wonderful Sunday and thanks for taking us along! Hugs! Wow, you are blowing my mind with all these new products. Thank you SOOO much for this awesome recap. I can't imagine being at the show - I would have been on sensory overload and drooling on myself. Where do I start in deciding what I want to purchase for my tiny little boutique. I need to be choosy and have different and unique stuff that will sell but set me apart. Any hints would be helpful! For those of us who aren't able to attend CHA, it's always fun being the mouse in your pocket seeing all the new products, colors, etc. I think I'm most anxious to try Ranger's new distress paints. After that I'd love to get my hands on any of the new products. Now to hurry up and wait for items to store shelves! Thanks for the trip around the show! I spent so much time in the ranger booth, I am sure they thought I was a stalker! If we lived closer we could get into some serious trouble!!! Thanks for the details on the peeps and good at the show. So many cool things. My favs include Tim's giant number stamps, Tim's clipboard and pediments dies, the mechanical line by Anna, the Engravers line by Prima, the Secret Garden line by G45, and that envelope punch board looks pretty cool. So excited about these releases. Thanks for a chance to win some goodies. Funny to see the Easter blueprint stamps as I just ordered these from my LSS. Hugs! Cool - Anita thank you for the amazing tour of products! I love the new stamps from Tim Holtz, the new Dylusion inks and the Distress Paints. I've read about the CHA it must have been amazing! I heard about the new Ranger items, f.e. the Distress paint and glitter, I heard about loads of new scrappapers and stamps. Thanks for sharing your pics and so many details... it's now official... I can never EVER be a Buyer because I would want to buy nearly everything! Wow, wow, wow! Like Marjie - I'd be like a kid in a candy shop and end up very, very sick and flat broke!! And for one thing from another manufacturer - I LOVE Finnabair's new range for Prima - wow!! Thank you so much for sharing your adventure with us - and for the fabulous giveaway chance too. 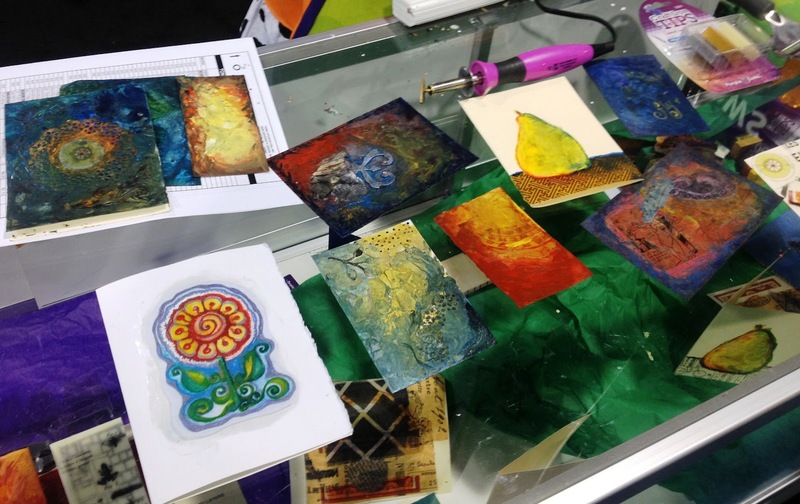 Thanks for sharing all these great details from the show, for those who only see the show from the internet, it's great to see so many pictures.I can't wait to try out Wendy Vecchi's new embossing paste, it looks like a lot of fun to play with. I also am hoping to get a couple of Tim Holtz's new dies, the Distress paint has piqued my curiosity- is it really that different from other paint?? Thanks for the giveaway opportunity! Wow! So many yummy things to spend money on. 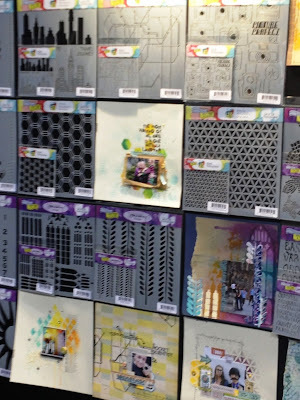 I want all of it but especially the new paper and embellies by Finnabair, the stencils and paste by Wendy Vecchi, the distress paints and alarm clock by Tim holtz, engraver collection by Prima,and I could keep going. I can't possibly pick one product. Someday I hope to go to CHA to see all the goodness for my self. Thanks for the pictures! Wow Anita, what a fabulous informative post with so much to see and think about. 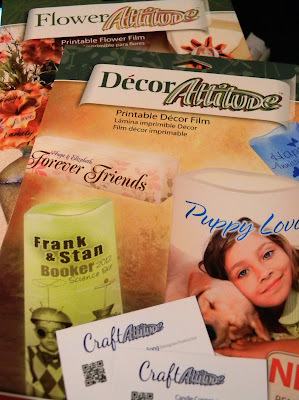 Thanks for the chance to win some goodies, but I really can't choose three products, I have distress paints, new stencils, lots of Tim's stamps and idealogy and so much more on my list, well a girl can dream can't she? TFS. Thank you for the great product summaries! My picks are Distress Paints, TCW stencils, and embossing paste. Now if I win the lottery all that is subject to change. LOL! Wow! What fantastic new releases. 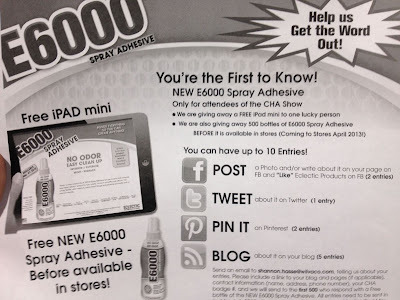 I didn't attend CHA but I've seen the videos from Dyan Reaveley's new Dylusions journal and new colors of ink spray. I've already snagged one of the journals but I'm aching to get those new colors! Anita, I LOVE your post !! That's the way I felt the first time I attended CHA !!! Totally love ALL the creativeness ... it was definitely my "Happy Place" . I'm a Tim-A- Holic , so I lived at Ranger, Ideology, Sizzix, Stampers Anonymous. I get so excited watching the demos, and seeing Tim at work. I had the "virtual" visit to CHA this year (thanks to many kind soles... such as yourself)! I LOVED what I saw of the demos of the new Distress paints oh and those new blueprint stamps FUN, Fun, Fun!! Dyan blows me away when I see her at work (saw sneek preview she did... she's amazing) I got hooked on her stuff... I gotta get some of her new colors... I just started playing around with her stuff...OMG FUN, fun... I gotta get her new Stamps with the top hat on it!!! I just want everything I saw in Idealogy...those RUB ONS ...OMG so cool... okay I have a very looooooooooooooong wishlist going... want some embosing paste too... heavenonly knows...I'll be learnin' some new stuff and "embracing" some mistakes...BUT I'll be having fun !!! Thanks again for sharing... sorry for rambling... it's you , Tim, gentleman crafter,, and G45's fault... I've been watching videos and recaps ALL Day ... LOL ! I'm drunk on CHA !!! This painting is incredible. I am sure your husband's jaw dropped. Mine did!!! Your talent is just awe inspiring! Oh yes, I so enjoyed the CHA recap. 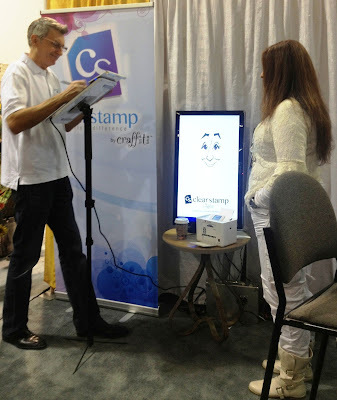 Those Urban Stamps look intriguing and I look forward to seeing your caricature turned into a stamp! I love just about everything Tim Holtz came out with, but the paints top the list. 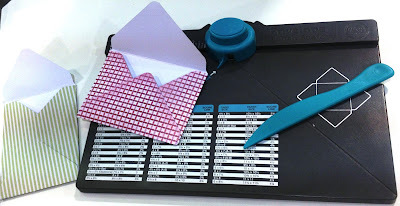 Also, the Envelope Punch Board is a must and I'm getting ready to preorder it. Plus, The Crafter's Workshop stencils - love love love. My picks...you got them all I think...anything Tim, The Crafters Workshop...love Dina, Ronda and Julie's new stencils. Did I mention Tim...LOL...the new Distress paints, the new Ideaology, the new stamps, the new papers, the new Alterations...what did I forget. The We R envelope maker looks cool...saw some great ideas for using Gelli prints for envelopes and this would be perfect to make them. And don't forget Dyan's new inks and stamps...love the couture stamps and stencils. I NEED the new White Linen spray!!! Hi Anita how wonderful to return from CHA to such fabulous news. Good luck and well done. I like you would find it difficult to define what would be recognised as my style. I like to try so many things so top 3 CHA goodies mmmmmm would definitely be G45s Secret Garden collection, Prima - anything and everything but probably the mechanicals embellishments and the new Distress paints looked fab when Tim was demoing them. Oh to win the lottery and not to have to be on a budget!!!! All that loveliness in one place: lovely talented people and lovely new products! Hmmmm... 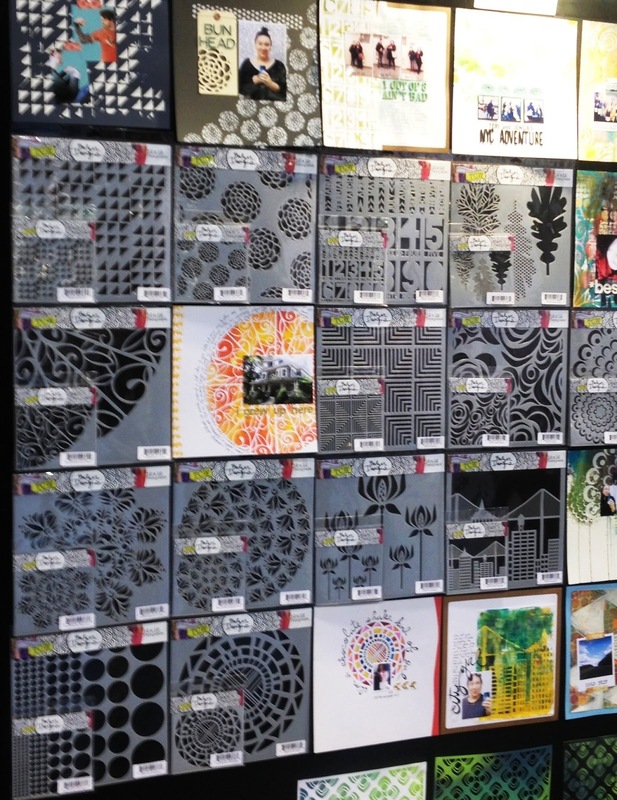 I want to play with Tim's Distress Paints and Julie Fei-Fan Balzer's stencils, and I want the new Fiskars Pro-cision Trimmer. I've heard so much about Tim's clocks - and can't wait to see them... and as you said stencils are everyone but truly look forward to seeing more from Crafter's Workshop and Julie. Thanks for sharing all the photos and the great time you had at CHA.